As an employee of StainedGlassWindows.com, I have had the wonderful opportunity to work with Glass Eye 2000 from Dragonfly Software. This CAD system has allowed me to use my creativity in designing images and patterns for our customers. 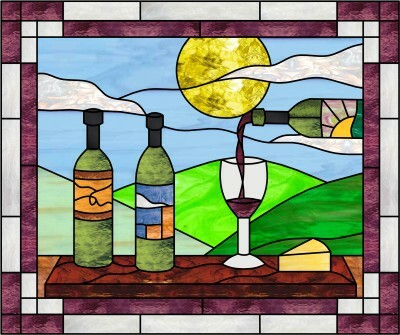 We specialize in custom stained glass work, and Glass Eye 2000 gives us the flexibility to draw what our customers request and what we think looks absolutely great. The software makes it easy to revise a design before the actual panel is created. We give customers the option of providing us with their own drawings, patterns, or images, and we can scan those into Glass Eye 2000 as our first step in creating their desired stained glass artwork. Being part of an internet based company, we always want to makesure our customers are pleased. Letting them visualize what they are going to get gives them reassurance that they are in good hands. Glass Eye 2000 has been one of the main reasons why our company has been so productive. The ability to speed up the process of creating stained glass is amazing. Customers sometimes hesitate to request a change, but I can usually say "It is just a click of a button." With our design studio situated in San Diego's Little Italy, I have often wanted to create a panel that would tie in with our location. A couple of years ago I had opportunity to travel throughout Europe. Italy was my favorite country by far and inspired me to create a pattern using an Italian theme and their love for wine. By using different textured glass and glass types, I was able to capture the essence of this image. This panel was created using the Tiffany (copper foil) method. It was amazing to see the image come to life. I created this pattern not for a particular customer, so we had it displayed in our showroom for about a month. 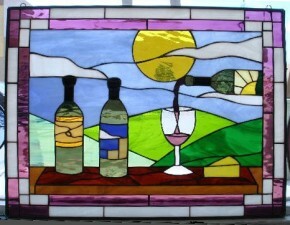 A vineyard owner, who plans to hang it up in their living room window, recently purchased it. It was awesome to hear the different compliments we've had on the panel, and I am glad that someone found it to be the perfect fit for their home. Renielle has lived in San Diego for most of her life. She loves traveling, arts and music. Her interest and fascination with historical architecture brought her to where she is today. She graduated in 2007 from San Diego State University, earning her Bachelor's Degree in Art with an emphasis in Interior Design. She hopes one day to be an interior architectural designer. She has been a designer for StainedGlassWindows.com for a little over a year and considers this a great opportunity to expand her horizons within the art world.